Like any good Muppets movie should do, Muppets Most Wanted begins by announcing what it is to the world. “We’re a sequel, dammit, so like us or don’t like us!” But it’s the Muppets, and the Muppets are impossible to hate. If you were looking for a Muppet movie that is equal parts charming, funny, and chaotic, then Muppets Most Wanted will give you everything that you are looking for. Muppets Most Wanted picks up almost directly where the last movie left off, with the Muppets reunited and famous once again, but this time without the help of Jason Segel or Amy Adams. Celebrity cameo numero uno is Ricky Gervais as Dominic Badguy, which is French for “good man,” as their new manager. Celebrity cameos in any given Muppets movie are always exciting. I wait for the cameo like people wait for the scary moments in a horror movie. While The Muppets was something of a bromance, Muppets Most Wanted is an old school caper. It turns out that Kermit has a doppelganger named Constantine, who happens to be the most dangerous frog in the world. Constantine escapes from the Siberian Gulag where he was imprisoned and switches places with Kermit. This body switch makes up for most of the film’s best jokes. Watching a frog with a Russian accent try and learn how to do a Kermit voice is absolutely delightful. In fact, “delightful” is probably the best way to describe Muppets Most Wanted. Even when it does go wrong (more on that in a bit), there is no way this movie can’t make you happy. Each celebrity cameo is great because of the way they are all employed in the story. Having Usher be an Usher is probably one of history’s greatest anti-jokes. Muppets Most Wanted is worth the price of admission just for the rendition of “I Hope I Get It” with Danny Trejo and Ray Liotta. Now that is a sentence I never thought I would get to type in my life. Muppets Most Wanted finds as much middle ground as possible between what both kids and adults will love. If it is a good family movie, then adults should be able to enjoy it, as opposed to just feeling the need to tolerate it. There might even be more here for adults to enjoy than kids. Some of the pop culture references are so subtle that you can’t help but admire them. A lot of comedies set in prisons will reference The Shawshank Redemption, but only Muppets Most Wanted will reference it simply with a Rita Hayworth poster that has Miss Piggy’s face. 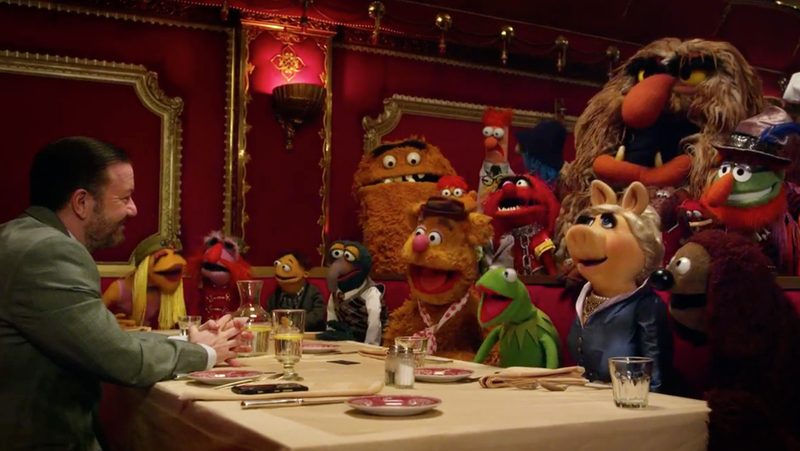 When you have a movie like Muppets Most Wanted, it is impossible not to compare to both its predecessor as well as all other Muppet outings, given that the Muppets are an American institution. In that regard, Muppets Most Wanted is underwhelming. It throws a lot of the more well-established characters to the side at times to let in room for new characters. That is fine, as most of the new characters that are introduced are great (except for Walter, he doesn’t really bring that much to the table). Even though the last movie focused on two brand new characters, it still felt like every well-established Muppet got his or her moment in the sun. The Muppets are and always have been about going meta. There is a saying that “once you go meta, it’s hard to go back.” Some claim that this is what ruined The Simpsons (though I believe there were many more good episodes after “Behind the Laughter,” but this discussion should be saved for another time). The problem with Muppets Most Wanted is that it eventually forgets the promise of the opening song and and gives in to its heist movie nature. Every movie for kids need to have a lesson in the end. However, if you are going to go meta, then you have to go all the way. Muppets Most Wanted is still enjoyable and packs in just about as many laughs as it should. It is great fun but it has a little less of the anarchy that always makes the Muppets so great. What I am trying to say is that Muppets Most Wanted isn’t bad, it just could have used a pair of fart shoes. How long before Phil Lord and Chris Miller are asked to direct the next Muppets movie? It’s unfortunate that two of the movie’s best visual gags (the giant badges; Tina Fey tripping over a stool) were spoiled by being shown in every single trailer and commercial. Hey, is Ricky Gervais still an atheist? Just checking. It really is a bummer that this flopped at the box office this past weekend. If you are a Marx Brothers fan, there is an amazing reference to one of their classic bits in Muppets Most Wanted. Even if you aren’t familiar with the Marx Brothers, the bit is still just as funny. Now that is how you make a good reference. With her Kermit Shrine, Tina Fey’s Nadya is basically Helga Pataki. There is some shameless product placement for Subway here, but it is used so well and the scene is so funny that I completely forgive it. Miss Piggy’s dog is pretty great. My favorite Muppets: Animal, Beaker, and Swedish Chef. For some reason, all my favorite Muppets are the ones that make weird noises. This entry was posted in Uncategorized and tagged Christoph Waltz, Danny Trejo, James Bobin, Jim Henson, Movie Review, Muppets Most Wanted, Nicholas Stoller, Ray Liotta, Ricky Gervais, The Muppets, Tina Fey, Ty Burrell on March 25, 2014 by ian0592.